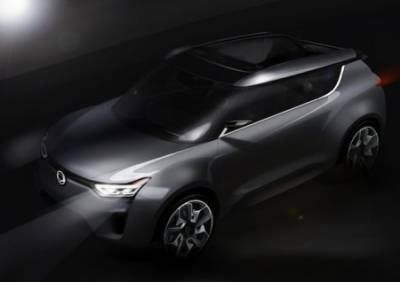 It is easy to guess that comes to mind is the man when he hears the phrase "hatchback crossover SsangYong". The most awkward expression is simply hard to imagine. The company SsangYong has never been famous for its attractive design, but only representative of the current SUV with retractable roof - Nissan Murano CrossCab - and not particularly beautiful. Nevertheless, the concept of SsangYong XIV-1, which was first shown at the Frankfurt Motor Show, may be called a decent-looking, that instead of folding the roof in an unsightly bulge on the stern of a car, removes it for the rear seats. Currently, the company introduced a couple of SsangYong rendernyh car images and official press release. So we have to wait for the opening of the Geneva Motor Show, before we know more about this vehicle.